The need for the multi-purpose centre in Deben was identified by the Gamagara Local Municipality in the 2011/2013 Intergraded Development Plan (IDP). Gamagara Development Forum (GDF) realised that a multi-purpose centre is a necessity in this community to assist in reducing the children from the streets, to reduce the substance abuse in the community especially among the youth, create employment and serve the community at large for various activities needed. The centre is created to provide accessible facilities to cater for a wide variety of community needs, including strengthening the cultural and social activities in the area. It created employment for the local labourers and local businesses throughout the construction phase. The multi-purpose centre has a purpose made hall, the youth centre which is going to be used for computer training and advisory services and it also has the soup kitchen where the workers will offer services such as handing out food to the less fortunate, people affected and infected by HIV/AIDS and related disease and also the orphans and old age people. Kathu Rural FET College is an associate of Northern Cape FET College and caters to a majority of the youth from John Taolo Gaetsewe (JTG) District. Currently the college does not provide the library/media centre, for the students therefore making it hard for them to be able to do their assignments because the computers that they use during class hours do not have web access. The Department of Education as well as the College identified the need of the resource centre for the students. Gamagara Development Forum (GDF) saw the need to take upon the responsibility of constructing the Kathu College Resource Centre which will afford learners the necessary tools and equipment to advance learning, as it is a way of investing in the community of Gamagara through education as GDF has prioritized education as its top priority focus area and because it is very important that students study in a safe and conductive environment in order for them to be able to produce great results and in order for them to have a bright future. Olifantshoek is divided into four areas them being Ditloung, Welgelee, Skerpdraai and Diepkloof. The area of Olifantshoek is characterized by individuals who are depended on social grants. Olifantshoek has two halls at Ditloung and Welgelee, however both halls are very far from the community of Diepkloof who are also in need of such a facility, hence Gamagara Local Municipality identified the need for a community hall in Diepkloof in the 2011/2012 Intergraded Development Plan (IDP). 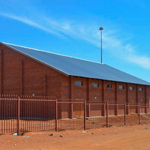 Gamagara Development Forum (GDF) took the responsibility of building the Olifantshoek Community Hall. The Olifantshoek Community Hall is created to provide accessible facility to cater for a wide variety of community needs, including strengthening the cultural, recreational and social activities in the area. The project created employment for the local labourers and local businesses throughout the construction phase. The Community hall will serve as a safe environment where the cultural groups and choirs from the community can gather, the community hall will provide accessible facilities to cater for a wide variety of community needs including strengthening the cultural and social activities in the area, and also a hub to foster skills development such as business skills and initiatives for the communities within the Diepkloof area.